I’ve been thinking deeply for a few weeks about how to share my summer of learning. I started the summer by attending ISTE and had a wonderful time of networking and sharing. The massive vendor hall and hundreds of sessions, however, left me feeling brain dead. I wondered how I could assimilate all of the ideas and make any meaning out of them. Part two of my summer included a two week family trip to England and Scotland. I had a bucket list including a visit to the Lake District to see where one of my favorite poets, William Wordsworth, got his inspiration. Being in the place gave me an entirely new perspective and caused me to begin asking lots of questions. I also had the opportunity to visit the area where Beatrix Potter painted and wrote, and we finished off the trip with lemon cake at The Elephant House where J. K. Rowling began writing Harry Potter. So, physically exhausted with jet lag and brain damaged from the fast-paced learning at ISTE, I was ready to put an end to travel. I’m so glad that I didn’t let that stop me from attending and presenting at BLC in Boston. BLC brought everything together for me. My original blog post was going to be about less is more. I thought about calling it Lessons from Poetry because visiting the Lake District and reading Wordsworth’s poetry made me realize how important it is to be thoughtful about ideas. You can’t read poetry fast and you can’t speed walk through the ISTE vendor hall and assimilate everything at once. BLC confirmed my suspicions that less is really more. There were fewer people but many more opportunities to talk in depth with people about ideas. In one speed networking session I met teachers from Austria, Australia, Latvia, and South Africa. We shared our contact information and are looking at ways to connect our students. BLC is all about global connections. Alan November hit home with his one-to-the-world session. We need 1:1 computing to put the world in our student’s hands, but we shouldn’t focus on the device. We need to focus on giving our students the opportunity to learn new perspectives, connect globally, and be global publishers. The Notosh session with Tom Barrett helped me bring understanding to my crazy summer. He led us through design thinking in an hour that covered immersion, synthesis, ideation, prototyping, and feedforward. After going through the process with my very fun group, I decided to apply the process to my summer experiences. I tried his activity of 100 ideas in 10 minutes to brainstorm all the things that I’ve learned this summer. Here’s the list! I ended up with about 50 ideas in ten minutes but decided to go through my notes and stop at 150. I think this is a good start for me to begin identifying problems to solve. I would also like to go through this process again with a group. I’ve been reading Tom’s book, Can Computers Keep Secrets, and I’m really excited about applying design thinking to instructional activities. 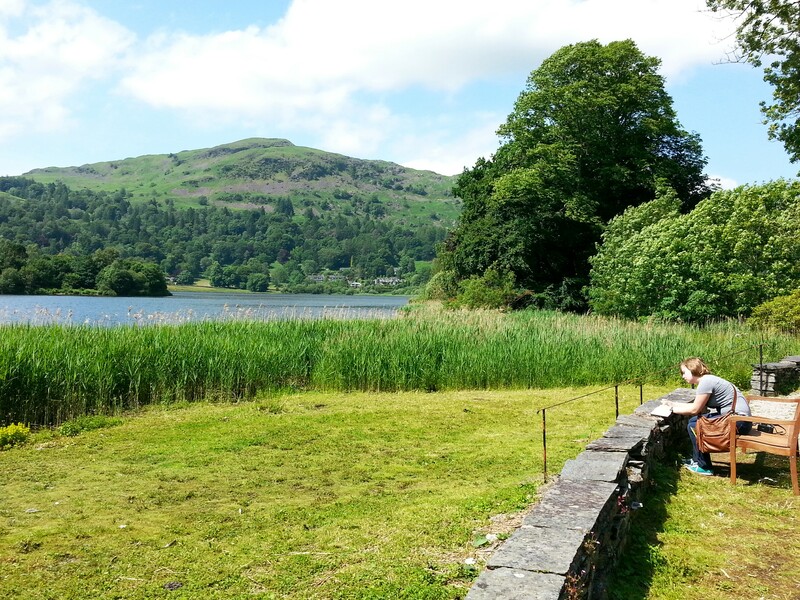 I used my trip to the Lake District to go through the design thinking process and how it might translate if used in a classroom. I asked lots of questions generated by my visit to the homes of beloved authors and I was able to make everything connect. If I were planning a design thinking activity with a class, my generative topic might be “Why Do We Create?” Does lemon cake and ginger beer give you ideas for caldron cakes and butter beer? If you’re painting in the garden and see the white tail of a rabbit disappear, does that get you thinking about what the rabbits are really up to? When the sun breaks through the clouds in the Lake District, do words start tumbling around in your head? In his ISTE keynote, Adam Bellow said that innovation is the intersection of fear and bravery. I hope that my bravery is sharing my thought process will encourage you to make connections, remix ideas and start conversations that will lead to innovative ideas and design thinking in your school or district.